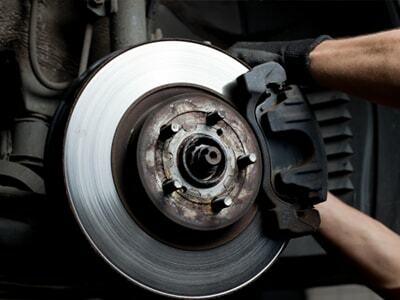 Our ASE Certified Master Technicians can quickly diagnose any brake squeaks, brake squeals, brake grinds. If the stops are jerky, or the warning light comes on, bring your car to Adams Auto Care for a thorough inspection and a speedy repair. We will give your car a thorough brake system evaluation, and if need be, will replace brake pads or brake shoes. We generally recommend replacement of disc rotors with new pads and hardware to help maximize braking efficiency and your long term satisfaction. In days of old, many cars had their brake rotors or brake drums “Resurfaced” to make them flat and true again. With the advent of lighter vehicles, there is not as much metal on these parts and they are highly susceptible to warpage from heat. Warpage is a common problem in Castro Valley with our hills. Warpage of brake rotors or drums can cause your brake pedal to pulsate and your steering wheel to shake in your hands when the pedal is applied. Adams Autoworx strives for the best and safest possible brake service. This is why we recommend new rotors with most brake services that are performed. If you think about it, brakes are probably the one of the most stressed parts of your car. Driving around, you apply brakes hundreds of times, and every time they are applied, there is plenty of friction, heat and stress on the brake pads, brake shoes and other parts of the system. Given the daily stress they are under, brake systems are truly marvels of engineering – for the most part, they work every day, uncomplaining, and slow down thousands of pounds of moving metal – at a mere touch of your foot. Most of the cars on the road are equipped with anti-lock brake systems as well – sensors tell the brakes when the car is about to lose traction, and the system will compensate for that, allowing even faster stopping without skidding. Naturally, all that friction causes wear and tear on the brake system; hence this is one of the areas of your car that needs regular inspection, and repair or replacement of parts. At Adams Autoworx we take your brake health very seriously – we use only Original Equipment parts, and our master mechanics do both static tests, as well as test drive each vehicle to verify that the repair was done correctly. So if your brakes squeak, squeal or grind, it’s time to make an appointment online, or give us a call and have your brakes checked by our master mechanics. Come on in and experience the Adams difference – a Castro Valley auto repair shop that partners with you to “Maximize Your Transportation Dollar”.